Chain life will vary appreciably depending on the way the drive is lubricated. A properly lubricated chain can last more than 100 times as long as the same chain with poor lubrication. A good grade of clean petroleum oil without additives, free flowing at the prevailing temperatures should be used. Some additives leave a varnish or gum deposit which prevents the oil from entering chain joints. Heavy oils and greases are generally too stiff to enter the chain joints and should not be used or it should be heated up indirectly and chain should be immersed in molten bath. 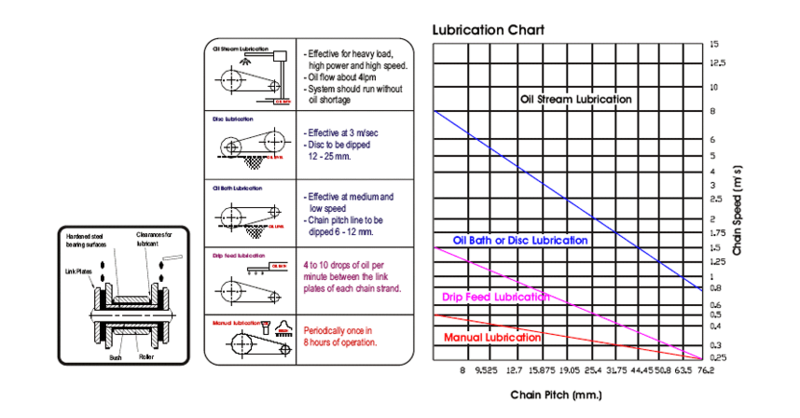 With proper lubrication, a separating wedge of lubricant is formed between the pins and bushings in the chain joints, much like that formed in journal bearings. The viscosity of the lubricant greatly affects its separating force and its ability to become a wedge between moving parts. The highest viscosity oil which will flow between the chain link plates and fill the pin bushing areas will provide the best wear life. This is essential to minimise metal to metal contact and, if supplied in sufficient volume, the lubricant also provides effective cooling and impact dampening at higher speeds. The best lubricant for most applications is a light petroleum oil. High viscosity oil and grease are suitable only for slow drives exposed to weather conditions. Chain drives should be protected from dust, dirt and moisture. Depending on the type of application and type of lubrication, system should be cleaned and oil change is recommended after the first 500 operating hours, to be repeated every 2500 hours.